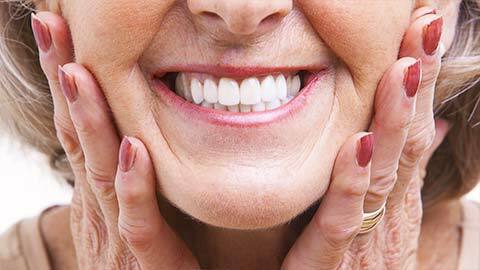 Artificial replacements for your teeth called dentures are helpful if you have only a few teeth or none at all. It might seem like a strange idea for you, but soon enough they will feel comfortable and you’ll be able to eat what you enjoy. And you can actually look the same as before you lost your teeth. Dentures come in two styles: partial, and full or complete. First we make a model of your teeth by taking impressions. We send it to a lab where it is used to create custom-made dentures. 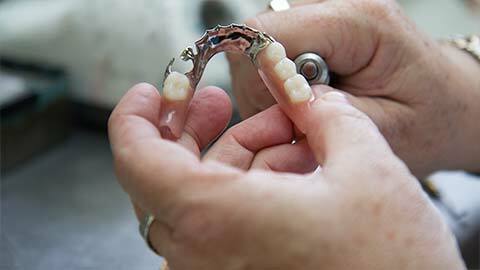 When a few teeth are missing and nearby teeth are not strong enough to hold a bridge, partial dentures are in order. We fit clasps onto nearby natural teeth to hold one or more artificial teeth in place. At night, and for cleaning, you can remove the partial denture yourself. If all your teeth are gone, you need full or complete dentures, commonly known as “false teeth.” These are removable and are held in place by suction. Two types are common: immediate dentures made before your teeth are removed, and conventional dentures, made afterwards. As with partial dentures, these must be cleaned well regularly. Improved technology has made dentures popular. As a denture wearer, you will no longer need to fear speaking properly or denying yourself the food you love. And you can look the way you did with all your teeth. Our Trimac Dental Centre team is ready to talk dentures with you.